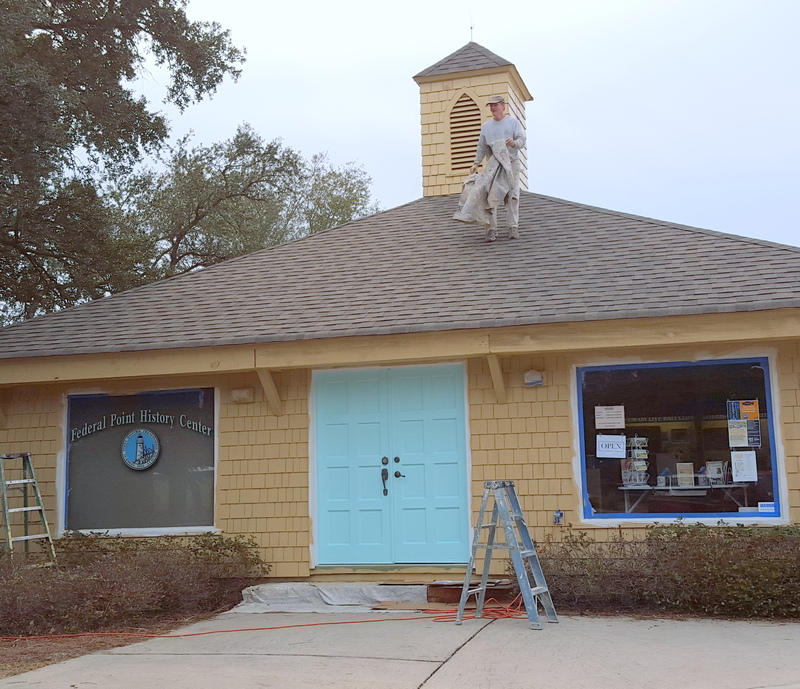 The Federal Point Historic Preservation Society will hold its monthly meeting on Monday, March 21, 7:30 p.m. at the Federal Point History Center, 1121-A North Lake Park Blvd., adjacent to Carolina Beach Town Hall. Due to unforeseen circumstances a representative from the US Army Corps of Engineers will not be our speaker this month. We hope to reschedule them for next fall. Instead, Rebecca Taylor will present a program on “Finding Your Family History.” She will cover the major databases, both free and subscription including Familysearch.org and Ancestry.com as well as other ancillary sites like Newspapers.com and Find A Grave. This is a basic, beginner’s introduction to genealogy and will focus on things anyone can do on their own from home or the public library. A retired librarian, Rebecca’s interest in her family’s history was kindled by watching Who Do You Think You Are? and Finding Your Roots as well as taking a trip to the Midwest where her paternal ancestors were from. And, of course, like anyone living in SE North Carolina, finding her Civil War ancestors. It helped that her partner, also a retired librarian, had been working on her family history for a number of years and already had a subscription to Ancestry.com. Rebecca will also recount some of the mistakes she made in the beginning, and how she traced her maternal line all the way back to the sister of King Henry VIII and Robert Stewart, the illegitimate son of King James V of Scotland and Euphemia Elphinstone. This lively program will include PowerPoint slides, guided computer searches, and personal stories, as well as helpful handouts designed to give people a jump-start at finding their own family history. There will be plenty of time for questions, as well. Brewer’s Inn was on Harper Avenue near the intersection with Lake Park Boulevard. 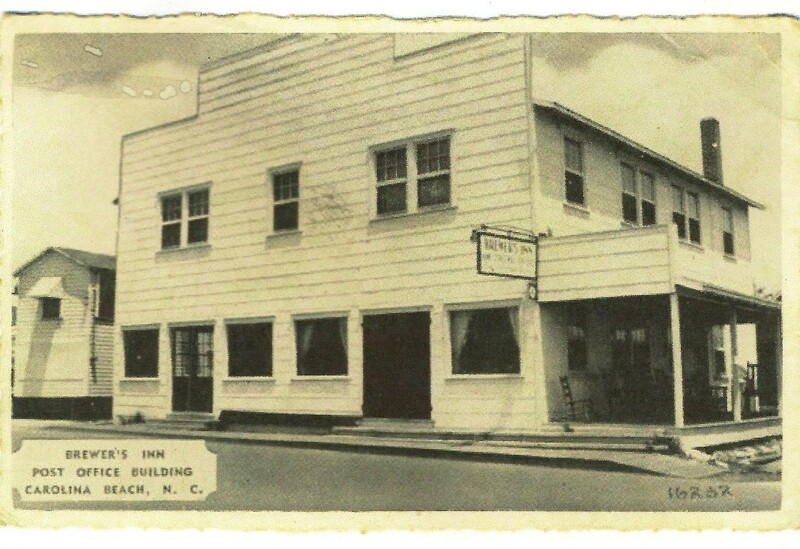 It was located where Bank of America and its parking lot are now and across from the drug store building, now Laney Real Estate. We would like to know more about Brewer’s and are asking for help from the community. At one time the post office was in the building which was obviously a hotel or rooming house. We are wondering who owned it, how many rooms it had, and so on. We are also curious about the tiny building next to it on the corner: was it a business on the ground floor with place to stay upstairs? In the color post card it looks like it had flat awnings that flipped up and revealed some type of open air market. Does anyone know who owned it and what they sold? There are three houses between Brewer’s and Risley’s Cottages and Rooms also in the post card. One has a red roof and the other two have brown roofs. Were they private homes? If so, who lived in them? Thanks for your help! “The building was completed on July 4, 1951. My parents proclaimed that day Robert Bruce Freeman Day and celebrated it for many years afterward. 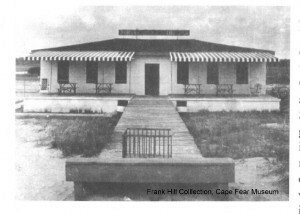 The building was large, even grandiose compared with many of the Carolina Beach structures, and was situated three thousand feet from the ocean, its white cement façade gleaming above the dunes. There was a dining area (which doubled as a dance floor at night), a long counter for take-out orders, a locker room, bathrooms, shower rooms, and two bedrooms in the back for the family. 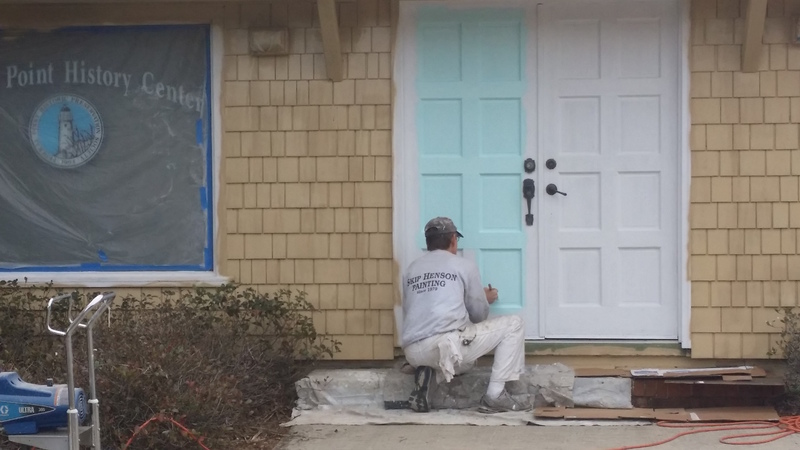 A local muralist painted the entire interior with brightly colored seascapes, and my father built a hard red clay road from 17th Ave to the parking lot adjacent to the building claimed by the Town of Carolina Beach to be its northern boundary. My mother, with help from workers in Wilmington, kept the restaurant as spotlessly clean as she did her own house, and her clam fritters were as famous as McDonald’s hamburgers are now. Black people came to the beach from all over the country and my parents were instantly successful. 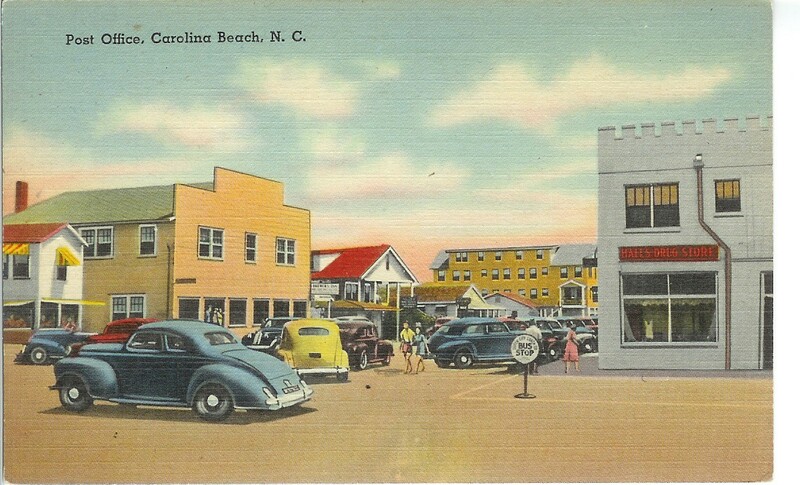 Surprisingly, many whites vacationing in Carolina Beach also frequented the restaurant and danced without incident both in the building and on the pavilion my father had built a short distance into the ocean. The morning after the hurricane (Hazel, 1954) passed, my parents rushed to the beach to assess the damage and saw nothing except smooth sand still being washed over by the ocean where their building had stood the day before. My fatalistic mother’s reaction was stoic and she directed her energies to the care of my father, who collapsed and was bedridden for several weeks. Their loss was compounded by their having been unable to obtain a bank loan to build, and so a large part of their savings was washed away with their business. Nor did their insurance cover water and wind damage. Nevertheless, my father rebuilt, pulling concrete block after concrete block from the sand where the remnants of the demolished building lay. Having learned about the force of hurricanes, he positioned the new structure further back from the ocean and purchased insurance for wind and water damage from the only company that offered it, Lloyd’s of London. Just imagine. Two days in a car with the four of us. On February 17th and 18th we set out to visit a number of small, non-profit museums. The goal: look at their current exhibits, and talk to them about how they fund, produce, and publicize their displays. We started off at the Missiles and More Museum on Topsail Island. Rose Peters was gracious enough to come in for a morning, even though they aren’t open to the public this time of year. She shared a whole bunch of ideas with us and several of the businesses she uses for exhibits are actually in Wilmington. The best ideas: use carpeting to back exhibits, then put Velcro on the back of the graphics and just stick them on. Also useful to us was the idea of using simple hollow core doors to mount exhibits on. We thought that might work well for us since we could fold them back to the wall when we have meetings. Swansboro was next, for a great (and huge) lunch at Yana’s. A real “hometown” treasure, with decor devoted to Elvis and the 50’s and onion rings to die for. Our next stop was The History Place, in Morehead City. It’s run by the Carteret County Historical Society and features not only exhibits, but also a large research library. There we talked to Director Steve Anderson who spent a long time talking to us about fundraising, as well as giving us a tour of their new (as in still under construction) exhibit on Pine Knoll Shores. We then drove up US 17 past New Bern to Plymouth, NC. And where is Plymouth? It’s on the south side of the Chowan River, across the Albemarle Sound from Edenton. It’s actually a very small town, with two small private museums, one on each end of town, about 6 blocks apart. We spent the night in a very nice Holiday Inn Express, though finding dinner was something of an adventure. The only two local restaurants downtown were closed on a Wednesday night in the middle of winter, but we found the police station and asked for a recommendation. A very nice young officer sent us back to the “highway” where we found Mama’s Pizza in the only shopping center with lights on. It turned out to have a nice salad bar and their pizza wasn’t bad either. After an hour or so we went down the street to the Roanoke River Maritime Museum, where Brenda Conklin greeted us warmly. It turns out she is the sister of the older man we talked to at the Port-o-Plymouth. They had some great exhibits devoted to boats large and small, as well as a replica of the Roanoke River lighthouse. 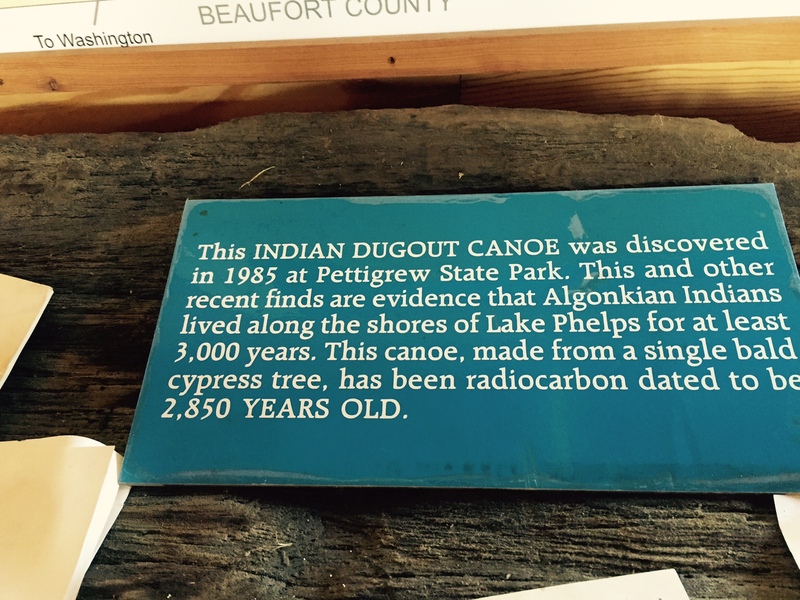 We even found a canoe on display that Leslie had excavated from Lake Phelps and preserved years ago. By late morning, we were ready to turn south. After a Wendy’s lunch in Greenville we made it to the Wayne County Historical Society museum in Goldsboro right on time. Chris Lawson welcomed us warmly and talked to us about their displays and programs. One fascinating exhibit is a diorama of the Battle of Goldsborough Bridge, a Civil War battle, waged in 1862 for control of the railroad hub. Our last stop was Liberty Hall in Kenansville but they were just about to close and we only had time to look at the exhibits in the modern building where tickets are sold. The guided tour of the house and grounds takes as much as 90 minutes, so we hope to go back another day. A huge thanks to Demetria who did all the driving. We certainly learned a lot. Some things to do, and some very definitely NOT to do. We’re working now on a proposal to take to the Board, for creating some seasonal exhibits and for refurbishing the display cases one at a time. We are so proud and lucky to have Charles “Skip” Henson as a Business Member! He is charming and friendly beyond belief as it is but, for the past two months, Skip has tackled the job of refreshing our History Center. He has pressure washed it and applied sealants to it. I actually thought it had all been re-stained the first time I saw it after he pressure washed it. Skip is a thorough, professional house and business painter. What he has done for us really gives us all renewed pride in our Society and our History Center. Skip, on behalf of every single member of the Federal Point Historic Preservation Society and the community of Carolina Beach where our History Center is located…THANK YOU!!!! 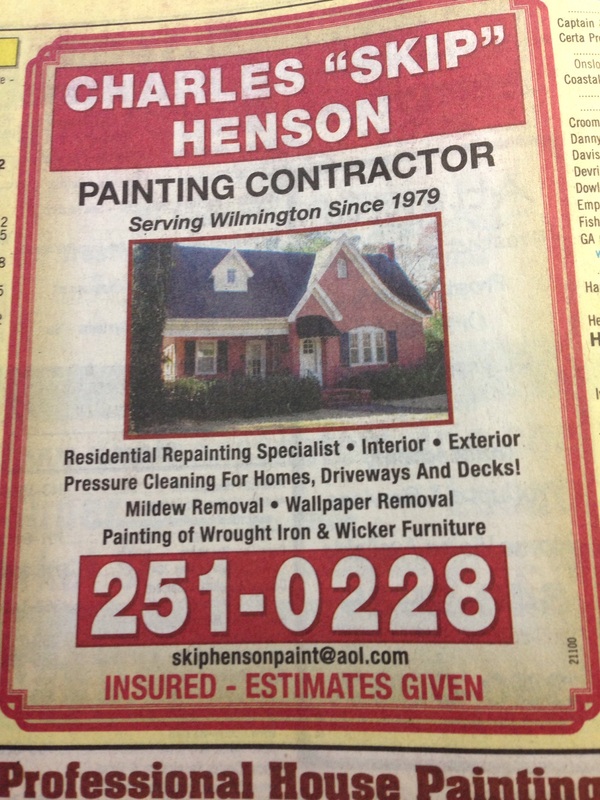 The next time you need painting, staining, mold removal, or pressure washing, please contact Skip Henson and let him know you appreciate what he has done for us and that you too support our History Center. The History Center recorded 67 visitors in January. We had 45 in attendance at the February meeting. The gift shop took in $56.99 in February. The History Center was used by Got-Em-On Live Bait Fishing Club and the United Daughters of the Confederacy for their monthly meetings. Have you seen our new “look”? A huge thanks to Skip Henson, Andre’ Blouin, and Vic Alocci for their TWO long days of prepping and painting. 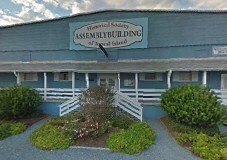 We’re still waiting for new landscaping and outdoor electrical work but before long NOBODY will be able to say they never noticed our building. Membership continues to grow. Welcome to Ann Boseman of Wilmington, Alfred and Dolores Anderson of Carolina Beach and the Jeffrey Stauffer Family also of Carolina Beach. A big thanks to John Pinna for renewing as a Lifetime Member. Knowing that 2017 is the 100th anniversary of the United States entering World War I, we would like to do a temporary exhibit featuring those who fought and those who manned the home front. We’re looking for pictures, letters, uniforms, or artifacts. Please let us know if you would allow us to borrow your family treasures for about 6 months. Walk limited to 25 people – call 910-458-0502 to register. Join Chris Fonvielle and John Moseley for a guided history tour of the Confederacy’s last line of defense on the Federal Point peninsula. Dr. Chris E. Fonvielle Jr. is professor of History at the University of North Carolina at Wilmington. John Moseley is the Assistant Site Manager and Education Director at the Fort Fisher State Historic Site. Walkers will gather at 2 pm at the Federal Point History Center behind the Carolina Beach Town Hall. They will then walk to the Carolina Beach State Park, ending at Sugar Loaf, along the Cape Fear River. Along the way Dr. Fonvielle will point out the remains of this important remnant of our local history. John Moseley, will be in Civil War costume and will demonstrate the firing a period gun. 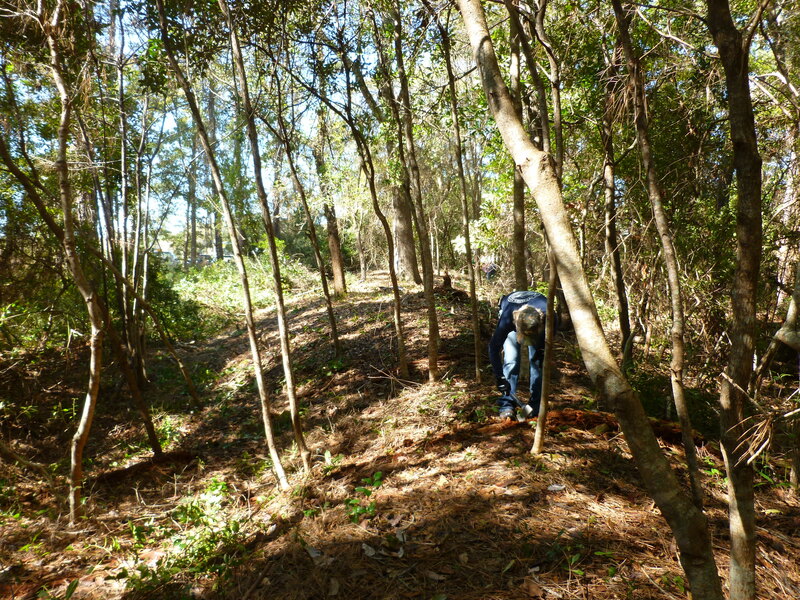 The Federal Point Historic Preservation Society is currently working with the Town of Carolina Beach and other local history organizations to create a park around some of the remnants of this line of trenches that are located between N. Lake Park Blvd. and St. Joseph St. Donations to the walk will go into the fund for use in establishing this park. As Union forces prepared to attack Wilmington by way of Fort Fisher in the autumn of 1864, Major General W. H. C. Whiting expanded existing defenses to meet the threat. 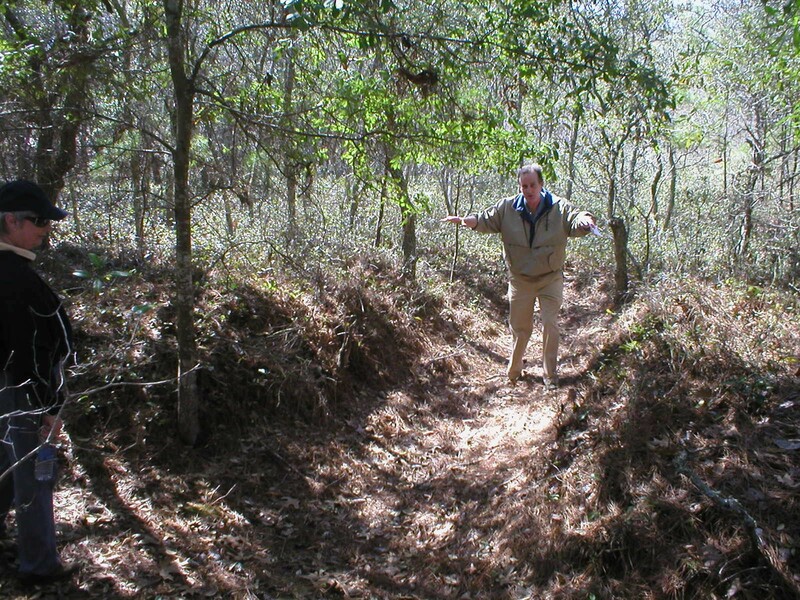 He selected a “strong position” stretching from the sound (modern Carolina Beach canal) to Sugar Loaf hill on the Cape Fear River, for an extensive line of earthworks. Sugar Loaf itself was a natural sand dune that stood 50 feet in height on the riverbank. Whiting planned to place a battery of artillery on the summit of the hill. By December 1864, the earthen fieldworks of the Sugar Loaf line ran for more than one mile from the sound to the river. Confederate forces continually strengthened them in the winter of 1864-1865. During the first Union attack on Fort Fisher at Christmas 1864, approximately 3,400 Confederate troops defended Sugar Loaf, including 600 Senior Reserves commanded by Colonel John K. Connally. General Lee sent Major General Robert F. Hoke’s Division of 6.400 Confederate troops from Virginia to try and prevent the fall of Wilmington. 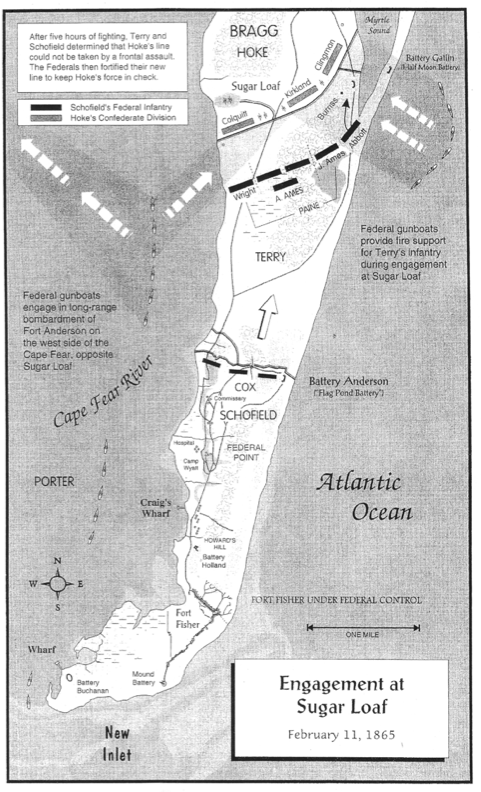 General Alfred H. Terry’s forces that captured Fort Fisher quickly turned upriver to strike Wilmington. They reconnoitered and probed the Sugar Loaf lines for a weak spot. On January 19, 1865, the Federals attacked with two brigades of troops, including Colonel John W. Ames’ regiments of U.S. Colored Troops. Unable to break through, they launched an even bigger assault on February 11. U.S.
Due to unforeseen circumstances the Corps of Engineers will not be our speaker this month. We hope to reschedule them for next fall. Instead our program will be “Finding Your Family History” with Rebecca Taylor speaking. She will cover the major databases, both free and subscription, including Family Search and Ancestry.com as well as other ancillary sites like Newspapers.com and Find-a-Grave. This is a basic, beginner’s introduction to genealogy and will focus on things anyone can do on their own from home or the public library. A retired librarian, Rebecca’s interest in her family’s history was kindled by watching Who Do You Think You Are? and Finding Your Roots as well as taking a trip to the Midwest where her paternal ancestors were from. 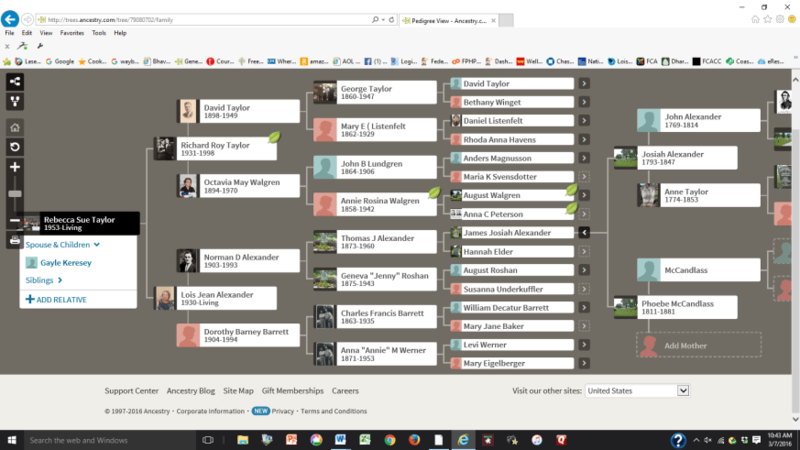 And, of course, like anyone living in SE North Carolina, finding her Civil War ancestor. It helped that her partner, also a retired librarian, had been working on her family history for a number of years and already had a subscription to Ancestry.com. Rebecca will also recount some of the mistakes she made in the beginning, and how she traced her maternal line all the way back to the sister of King Henry VIII and Robert Stewart, the illegitimate son of King James V of Scotland by a courtier named and Euphemia Elphinstone. This lively program will include PowerPoint slides, guided computer searches, and personal stories, as well as helpful handouts designed to give people a jump-start at finding their own family history.